1. TEMEISI 8-inch Chef knife is designed for professionals including chefs, culinary experts, food caterers as well as an ordinary person. 3. The steel blade contains 0.6%-0.75% for more strength and durability, and consists of 16%-18% chrome material to ensure the knife is resistant against rust/corrosion and won't rust. Why Choose TEMEISI 8-inch chef knife? 8-inch kitchen knife made from high-quality stainless steel can be used in hard tasks and still maintain its functionality for a very long time. It will also maintain its toughness and functionality for a long time. The weight and the size of this chef knife feels quite balanced.The Chef Knife Blade and Handle are Integrated Forging Design, The Ergonomic Handle Ensure a Secure, Comfortable Grip with no Fatigue. 【Stainless steel blade with high-carbon 】- TEMEISI professional 8 inch chef's knife is made from high-quality stainless steel. And to boost its sturdiness, the steel contains 0.6%-0.75% carbon, making it two times as hard as other knives in its class as they contain just 0.3% carbon. 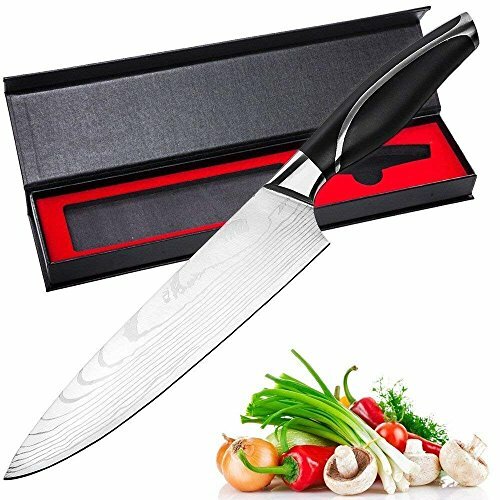 【Ultra-sharp edge】- Multipurpose chef's knife designed for chopping, mincing, slicing, and dicing with razor sharp, laser-tested, tapered knife edge is ground to form an exacting angle, to hold a sharp edge longer and ensures maximum cutting performance and durability to ensure the beauty and taste of the foods. 【Kitchen VersatIlity】 From cooking Asian, French, Italian, Japanese, Thai, Indian, Chinese, or Korean cuisines to making simple dishes, this sharp knife set suits everything.that resists rust, retains sharpness for longer and lasts for years. Stop sharpening those knives every few months. 【Ergonomic design】The weight and the size of this chef knife feels quite balanced.The Chef Knife Blade and Handle are Integrated Forging Design, The Ergonomic Handle Ensure a Secure, Comfortable Grip with no Fatigue. 【Perfect sale】Thank you for choosing our products, our TEMEISI products are produced under very professional quality inspection. If you are not satisfied with our product, just contact us and we can offer a full refund. No risk of purchase! If you have any questions about this product by TEMEISI, contact us by completing and submitting the form below. If you are looking for a specif part number, please include it with your message.